Six Core Modules. One Exceptional Program. The Complete A New Direction Program contains everything you need to implement A New Direction, including the six core modules, guidebooks for administrators and staff, outcome studies, forms, and research studies. The Complete A New Direction Program is proven to reduce recidivism and help offenders succeed in their communities. The Complete A New Direction Program is effective for a wide variety of criminal justice programs and is easily customizable to meet individual, facility, and budgetary needs. The modular format allows for standardization among multifacility systems, and this evidence-based program meets most federal funding requirements, including residential substance use disorder. Each module can be used separately, sequentially, or in any order. Complete modules include a facilitator guide, 100 client workbooks, and DVD components. Encourage clients to think about why they chose to participate in a treatment program and what they need to do to turn their lives around. Give clients the facts about what to expect after release and how to stay in recovery and crime free. Address common triggers and create a crisis management plan to avoid relapse. Explore the difficulties of building healthy relationships based on trust and respect. 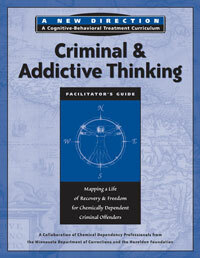 Draw the connection between substance use disorder and criminal activity.